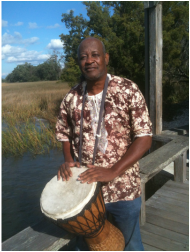 Bob Small is a lecturer on the Gullah Geechie culture. He has done research in the area since 1970, starting at Penn Center, near Beaufort, SC, where he interviewed and taped oral histories of Sea Island residents from St. Helena’s Island to Charleston. Bob collected artifacts and helped establish the first museum on Sea Island culture in the state. He is knowledgeable of Gullah Geechie customs and practices, and has done presentations for groups and conferences locally and nationally.